Here’s a video of the exchange. Spokespeople for state legislative leaders contend that conflicts of interest are taken seriously in Lansing and that -- with or without a conflict-of-interest law -- lawmakers are doing a good job avoiding them. Michigan could look to Florida as a model for conflict of interest policies. Since 1976, Florida legislators have been prohibited from casting votes on issues that could personally impact them financially. Here’s the statute. There’s no such ban in the Michigan House, and the Senate rule against voting on bills that have a personal impact lays out no penalty. Policies in the House and Senate allow legislators to cite a conflict of interest as a reason to not vote on a bill, but there is nothing barring legislators from voting on issues in which they have a personal financial stake. The result: Florida legislators have cited a conflict of interest on pending legislation 49 times in 2015 and 2016, according to official records of the Florida House of Representatives and Florida Senate; In that same spam, Michigan legislators have cited conflict of interest times. The Sunshine state also has a Commission on Ethics, a nonpartisan, state-funded office that investigates ethics complaints filed against public officials and state employees. Michigan has no similar office. 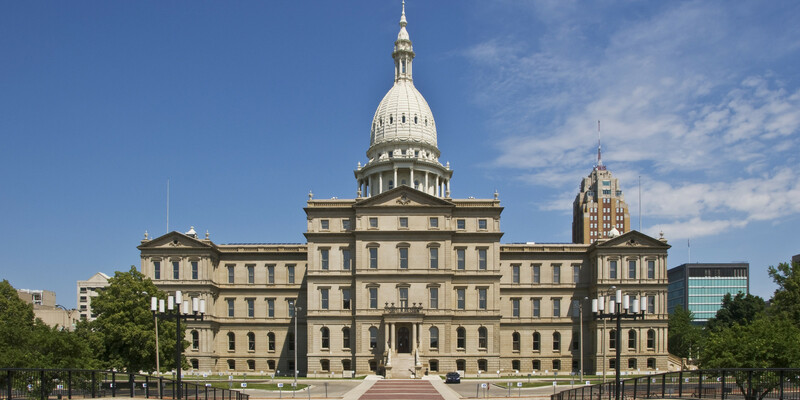 “It’s an honor system without honor,” said Chad Selweski, a Michigan journalist who analyzed Michigan’s conflict of interest policies for the Center’s 2015 national report. "We expect our members to identify any potential conflicts of interest and do the right thing by stepping aside during the vote,” said Gideon D’Assandro, spokesperson for Speaker of the House Kevin Cotter, R-Union Township. “It looks like House Republicans have been doing the right thing and recusing themselves when appropriate." Readers can make their own judgment by looking at the list of potential conflicts here. Here’s what the federal financial disclosure form looks like. Rep. Edward Canfield, R-Sebewaing, who’s in his first term, said it’s natural -- and preferable -- for lawmakers to enact laws that improve their own professional fields. Canfield said the measures wouldn't affect him since his certification does not expire. But the bills could impact his physician wife, who has had to take recertification testing three times. "Frankly she might retire anyway," Canfield said. "I just think it’s bad policy." Selweski, who wrote the Center for Public Integrity report on Michigan, said he sees holes in the current rules. Hmm. Many of those bills can also be viewed as term limits actually fulfilling their promise: Citizen legislators who know a great deal about the industry they came from introducing relevant bills to address a problem there. A few are blatant rent-seeking but there is no need to cherchez la lobbyist because - he’s the Rep! and it’s all fully transparent. Most of these are good bills. For example, the one banning requirements that doctors maintain "board certifications" relates to a new rent-seeking scam by various private medical entities promoting administrative rules or statutes imposing new requirements that have nothing to with health or safety but will give those groups a steady revenue stream. Similar on Callton on expanding chiropractors scope-of-practice. Scope of practice restrictions are a huge part of why medical treatment is so expensive, and even a self-serving attempt to lower one of these walls is to be admired. IOW, context matters. Finally, the real corruption arises not from the industry these pols came from but the one they're all striving to remain in: Government. By the time they reach the Legislature, practically every one of these people have as their main goal never having to be subject to the "hard accountability" of employment in the for-profit private sector. The goal instead is to become the PIO for the ISD or Community College, director of the DDA, board member of the new Water Resource Authority, etc. Perhaps a nice public affairs slot at a big hospital. Or, the holy of holies - appointed to Liquor Control Commission at $80k/year. Bottom Line: No one's going to rock the boat when their next job may depend on keeping a particular government special interest sweet. Doris, I think your point about adding expertise to the legislature and preventing it from creating conflict is very important. It seems that it suggests to separate but overlapping issues, do we want career politicians or 'citizen legislators'? How do we minimize the impact of potential conflicts of interest and how are voters assured that they are not undermining the quality of legislative actions? Do you see value in legislator being experts in politics or legislators who bring a diversity of expertise from their careers to the law making process? Is it valuable to have people that has medical care experience, people that have manufacturing experience, that have first-responder experience, accounting experience, educational experience, etc. and all that they have learned gaining that experience? Or is it better to only have career legislators who have developed campaigning skills, legislative process knowledge, media interaction, etc.? Are there potential for either or both to have conflicts of interest and how could that be addressed? The diversity of perspectives readers could offer on these question could be very helpful as we try to decide how we assess candidates and make out votes. Good discussion Jack. I think the answer to your hypothetical would be yes, they should vote on those things with a "but," with the but related to how you define "more rewarding." The question, which is not even hypothetical in some of the cited examples, is rather: is it a conflict of interest to vote on a bill that affects you or your family financially? In your example of a teacher being elected a legislator, the question would be, should that teacher/lawmaker vote on a bill that gives teachers a 10 percent raise? I'd say no. I would also note that in many of these situations it's impossible for the public to know exactly what the impact of a law change would be on a particular business or lawmaker's career. So to dismiss them all by comparing them to a generic teacher-education policy example doesn't work for me. Thank you for confirming my belief that the State of Michigan has declined to a point where only 20% of the voters trust the legislators. And thank you for giving me more reasons to know why. You note in your article that: a) Michigan ranks dead last in regulating legislative conflict of interest; b) Michigan ranks dead last in overall government transparency; c) Michigan is only one of three states not requiring personal financial disclosure of its legislators; d) Only one is five Michigan residents say they trust State Government. Now let me add my thoughts: 1) The Michigan Supreme Court used to be cited by the US Supreme Court as a sign of its excellent opinions and rulings; no more. 2) Since the State "takeover" of school funding, our schools have declined to the bottom 20% of the nations schools. Teachers have not had a raise in 8 years and are making less than they did 8 years ago. (And you wonder why enrollment in teacher training schools is down 30%) This will turn out to be a disaster. 3) Our roads are some of the worst in the nation. As someone who frequently travels around the country, I can attest to it. And yet, Keven Cotter and his band of "no new taxes" couldn't raise the sales tax 25 cents to fund our roads). 4) Gerrymandering in the State guarantees one party has a great advantage when it comes to elections. 5) Flint. No more need be said. (Remember Snyder and his gang changed the priority of the State Environmental agency from protecting the public to promoting business.) 6) Snyder got rid of the business tax that everyone hated BUT, contrary to his pledge that there were not loopholes or giveaways, we now find out there are so many the State will lose perhaps a billion dollars in revenue in the next ten years! 7) Term limits ARE a disaster. The Free Press did a lengthy report on how it actually works and it is depressing. In your last term you have ' only been in office four years but you have seniority so you head committees while you, of course, know you have to find another job. Hmmm. Interesting how many of them become lobbyists for the very companies they are supposed to be regulating! And here is my absolute best argument against term limits: L. Brooks Patterson. THE best run county in the State and one of the best in the Country! You see, it is not the lack of term limits that is the problem. The problem is the uneducated, disinterested, misguided voter. And because that is a really difficult problem to solve, you go for the "easy" solution that is no solution at all. (And as our educational system goes downhill, so do the number of educated voters which only makes things worse)..... In short, Michigan has become a really messed up State and I can only be grateful it wasn't when I worked and now that I'm retired, they can't really do anything to hurt me or my family. Thank you for sussicntly outlining what is going on in our state government. This legislature is a huge disgrace. Clearly they are not looking out for the best interests of their constituents. You forgot gerrymandering and election fraud (remember where a Democrat suddenly switch to the GOP at the last minute?). Yes, the Michigan legislature is a cesspool. As a current candidate for State Representative MI 109th and former State Employee (MDOC) I can assure you, corruption is now and has been a serious issue in State of Michigan government and bureaucracy and that retirement is no protection. I could not agree with you more George and very well said. I was born and raised in Michigan and have never seen this state in such bad shape, ranking at the bottom of the barrel on all quality of life issues and at the top of the ranks for such things as poverty. I find it interesting that so many of the comments made on this site now are from those who benefit from the likes of this current mix of legislators and the governor. There is such a lack of insight by any of those currently holding office of the reality of so many Michiganders. They ARE focused on their own agendas, are inexperienced in "governance", are blatantly self serving, AND they have the arrogance to be paid for this. Michigan could easily have a part time legislature (which it is right now anyways). The pay and benefits need to reflect the quality of performance of the last 5 years. The tragedy that has befallen Flint alone, the multi million dollar law suits should be deducted from all of their pay. It was under their watch that this happened. I have been writing to my legislators for 3 years about all of these issues and since they are so busy with their agendas, they do not even respond. There is no excuse for not having genuine Conflict of Interest requirements with binding teeth in them. We should also have full financial disclosure requirements for our State Legislators just as we have for Federal Office applicants. This legislature has shown repeatedly that they cannot be trusted to work in the best interests of the public. It's recognized nationally as the least transparent, most corrupt Legislature in the country. It's time for major reform. And Term Limits have done to help this problem, in fact they have only made it worse. This isn't funny, this is scary: “I don’t mind sleeping on the couch if it means I’m right,” Hertel said. Calling anything that benefits or involves an official how ever indirectly, a conflict of interest is a big stretch and maybe this kind of report is the reason there is such a vague generalized sense of mistrust towards the generic representative and government. And yet interestingly most voters seem to be very satisfied with their own rep since they almost always re-elect them! If Michigan's legislature is indeed so corrupt why aren't we seeing more of them being dragged out in cuffs? Why aren't we seeing anymore corruption scandals than any other states? Just because some un-vetted, supposed watch dog group with it's own agenda and perspective makes some very subjective charges just doesn't make it so. Matt you are missing the point. When voters put people in for 20,30,40 years people were upset and decided to put in term limits. Yet we get the same poor legislators. Why? The problem is the voters......they put these people in and "their" candidate is always "o.k.". That's why there is little hope for change until voters change. I happen to live in a very educated community that has been on the ten best places to live list and was just named the safest city in Michigan (and sixth safest in the US). We have great schools and government because we elect very, very good people. We fell for the "term limits will solve all our problems" nonsense. But guess what? When our mayor was term limited he got another term by having everyone write him in! Good legislators come from intelligent, educated, informed voters. Period. The sad state of our state rests with the voters.........they pick them. George, I think the term limits angle you refer to is irrelevant. Show me any evidence that legislative bodies without term limits lead to any better results. And instead they lead even more toward the situations that Jack refers - governmental/business/institutional entrenchment. I have a feeling you're not thrilled with the US congress? What problems that you refer to are you not seeing there? Or is it the political party in charge that is your problem? As far as the idea (dream) that the voters are going to somehow become politically and philosophically engaged and educated, You must be a lot younger than me! Craig the Gamrat?/Couser scandal is totally off topic and had nothing to do with the subject of conflict of interest or really any (financial) corruption. It really boiled down to leadership using ANYTHING to get rid of some uncooperative unpopular (and flaky) members. Had it been other members or definitely the other party nothing likely would have happened! Your second reference, corruption on the local level, besides also being off topic ... what else is new? I could take every elected official from the schools, city and legislature representing Rochester Hills and plunk them into Pontiac, Southfield or Oak Park. They could all govern in any one of those places for thirty years, and at the end of that time none would look a whole lot different than it does right now. You have a prosperous city, but it has very little to do with whom you elect and almost everything to do with who lives there--highly educated people with relatively homogeneous values. If Mike Duggan is the answer, I've asked the wrong question. This article is not particularly well thought out. What is important in these situations is the ratio of the legislator's personal interest to the public interest. If a bill is good public policy, that is, if it substantially promotes the general interest while incidentally benefitting the legislator, then it shouldn't trouble us. If it is wise policy to give judges a raise, then the fact that a legislator's daughter will benefit is not a big deal. And it would have been nice to know the facts concerning servicing septic tanks in the winter. How often does it occur that servicing a septic tank in the winter requires violating weight restrictions? How much damage does it do? In short, what is the ratio between the benefit of servicing the septic tank and the costs imposed on the community? And the bill related to Tesla should be judged on what arrangement benefits consumers, not whether it benefits franchised dealers. If, on the other hand, a bill confers little or no benefit to the public while conferring significant benefits to a legislator, then it should be disallowed. If an energy bill will provide no benefits to the citizens of the state, but increase the value of a legislator's shares, then that legislator should not be allowed to vote on the bill. Again, it is the ratio of the two that is important. Wow! The state is awful and you come up with this! You prove my point: the problem is the voter. If Michigan had a law to prevent Legislature from engaging in conflict of interest, I'm pretty certain the Michigan Legislature would revoke it. We have no laws and no teeth, to make our lawmakers work for us.